Red Room Audio’s inaugural sample library lineup, PALETTE, is a series of NKS™ (NATIVE KONTROL STANDARD) supporting thematic professional orchestral and cinematic virtual instruments for Native Instruments’ industry-standard KONTAKT platform — including the free KONTAKT PLAYER — aimed at songwriters and media composers. It was recorded in a dedicated hall with world-renowned performers by a passionate and experienced sample-making team. Truly a dream come true for its creators, the company collectively hopes that this expansive set of scoring tools truly inspires its users to write some significant music. An awful lot of content went into its creation, so it made sense to break it down into individual products. PALETTE – SYMPHONIC SKETCHPAD contains the building blocks to quickly and easily bring cinematic ideas to life. Lending a helping musical hand, an additional set of so-called BRUSH PACKS bring detail and compositional colour to the bigger picture by focusing on deeper and more specific scoring elements such as orchestral effects, percussion loops, or true-legato melodic ensembles, enabling users to easily choose the tools needed for the job in hand without getting bogged down with those that are not needed. Whatever way users choose to work, with all PALETTE instruments being performed by the same musicians recorded in the same hall by the same production team, they complement each other perfectly. 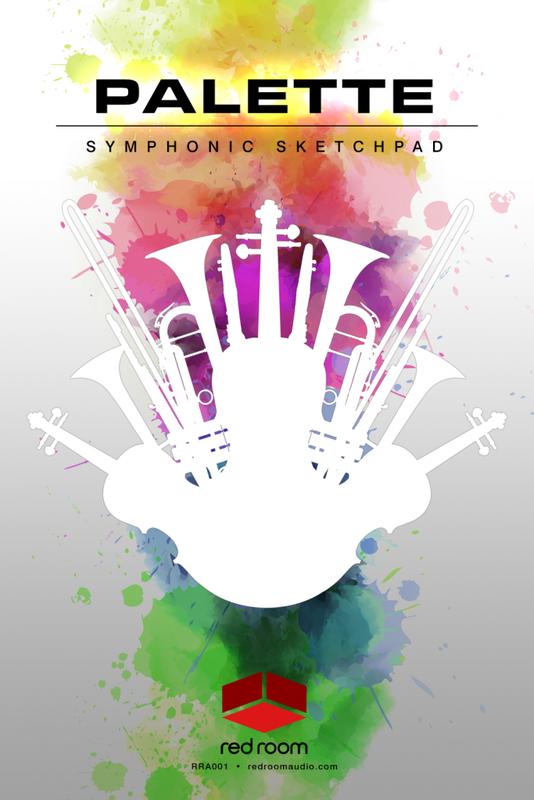 PALETTE – SYMPHONIC SKETCHPAD is a flagship (24 GB-plus) library featuring Strings, Woodwinds, Brass, Choir, and Percussion patches. Piano, Harp, and even a set of modern Trailer Tools plus Synth patches all add to the lengthy list of essential writing tools. The orchestral ensembles offer a nice variety of articulations, including four kinds of short notes, as well as trills, tremolo, pizzicato, and other deeper techniques. Three dynamic layers were recorded with up to seven round robins, while further flexibility abounds courtesy of two different (Chamber and Full) ensemble sizes, so users can go all out epic or as intimate as the musical mood may take them. And, as is the case with the entire PALETTE lineup, all players were recorded in standard orchestral seating positions with three microphone perspectives — CLOSE, DECCA (Tree), and HALL. However, since the room is spacious yet fairly dry, with only a 1.2-second tail, users can easily blend anything with other libraries using their favourite reverbs without being restricted to the sound of only one specific hall. The concept behind PALETTE BRUSH PACK 01 – MELODICS is simple: studying the scores of several favourite classical and modern film music composers, admittedly a most enjoyable exercise, ended in 17 of the most evocative melody-carrying combinations and instruments as a result — recordings of a soaring violin section playing octaves, regal trumpets with horns, playful flutes and piccolo, creepy bass clarinet and contrabassoon octaves, a gigantic and downright frightening low strings and low brass ensemble, and more besides. But equal emphasis was placed on soloists since they are so often used to deliver a melody, so six of those were recorded as well. With 16 of the 17 instruments in PALETTE BRUSH PACK 01 – MELODICS have true legato — Trombones & Tuba being the exception, many melodic bases are covered. PALETTE BRUSH PACK 02 – ORCHESTRAL FX is an aleatoric effects virtual instrument for media composers and songwriters. Red Room Audio feel fortunate to have worked with three outstanding composers from around the globe — namely, George Strezov, Jongnic Bontemps, and Tristan Noon — who collaborated to orchestrate a slew of useful effects for strings, brass, woodwinds and choir in six categories: Short, Long, Sting, Texture, Rise, and Fall. Many were recorded by all four sections, so easy layering is a given. Get this, though: in total there are over 2,400 unique performances — perfect for providing instant musical drama, emotion, character, and life. Load up one of the four section patches and keyswitch through the categories to perform individual samples from a keyboard controller. Creativity flows forth with the powerful FX Builder patch, allowing users to browse, select, and layer up to four effects with controls to adjust their volume, pitch, and timing. PALETTE BRUSH PACK 03 – RUNS & ARPS is the most in-depth virtual instrument for real recorded (not scripted) orchestral scales and arpeggios ever assembled! According to Red Room Audio, there was simply no better way to capture the emotion and subtle nuances of these unique articulations than to record them in their entirety — versus trying to cleverly combine samples to produce artificial phrases. Pushing the boat out, both strings and woodwinds ensembles were recorded playing scales in six primary modes — Major, Natural Minor, Harmonic Minor, Melodic Minor, Whole Tone, and Chromatic, each with up to 13 variations. There are also 20 kinds of arpeggios in four modes — Major, Minor, Diminished, and Augmented. Every run/arp has two round robins, can be performed in every key, and can sync to the DAW (Digital Audio Workstation) host’s tempo, totalling over 1,600 performances!